Last January, when the news exploded with the discovery of what was being called Planet 9, the Zetas described this as a prong in a multi-pronged announcement process that they had previously predicted. ZetaTalk Prediction 1/9/2016: The announcement is again close at hand, a multi-pronged announcement so powerful and from so many sources that it could not be denied. ZetaTalk Comment 1/23/2016: Now that Nibiru is so visible that the public is regularly seeing a Second Sun and the brilliant Moon Swirls, as well as the body of Nibiru itself with its double helix of its two most dominant Moon Swirls, the announcement is viewed as inevitable. We have described the planned announcement as a multi-pronged event that cannot be sabotaged. This is one of the prongs. Now it appears another prong is pending. Per the Zetas, there is no other explanation for the blitz of news article suddenly hitting the press, as noted in the Pole Shift ning blog covering pre-announcement clues. 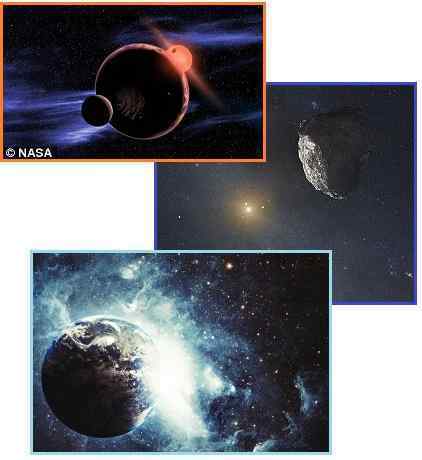 Articles covering various Nibiru related subjects appeared in scientific and popular media outlets on March 28, March 29, March 30, March 31, and April 2. The Zetas explain. Scientists searching a hidden ninth planet have spotted an unidentified object in the exact area they believed the Planet Nine to occupy. The giant iceball — similar to Neptune or Uranus — is believed to be nestling at the edge of our solar system. Astronomers had been desperately searching for more evidence of its existence since the discovery in January. Since its discovery at the beginning of this year, the mysterious ‘Planet Nine’ has had scientists looking for the signs that could confirm its existence. The giant hidden planet is thought to sit on the edge of our solar system and is 10 times more massive than the Earth, gaseous, and similar to Uranus or Neptune. The orbit of one of the most volatile exoplanets known to man, which can see temperatures rise and fall by hundreds of degrees in a matter of hours, has been tracked by NASA scientists, who visualized the wild temperature swings in its atmosphere. Outside of the solar system there are close to 2,000 exoplanets, many of them known as boiling hot Jupiters, due to their gaseous atmosphere and close proximity to fiery stars. Is Planet X to Blame for Earth's Mass Extinctions? Earlier this year, scientists at Caltech offered the most convincing evidence yet of a ninth planet, Planet X. Now, a retired astrophysicist suggests the hidden planet is responsible for Earth's periodic mass extinctions -- like the disappearance of the dinosaurs. Periodic mass extinctions on Earth, as indicated in the global fossil record, could be linked to a suspected ninth planet. There were three explanations proposed to explain the regular comet showers: Planet X, the existence of a sister star to the sun, and vertical oscillations of the sun as it orbits the galaxy. 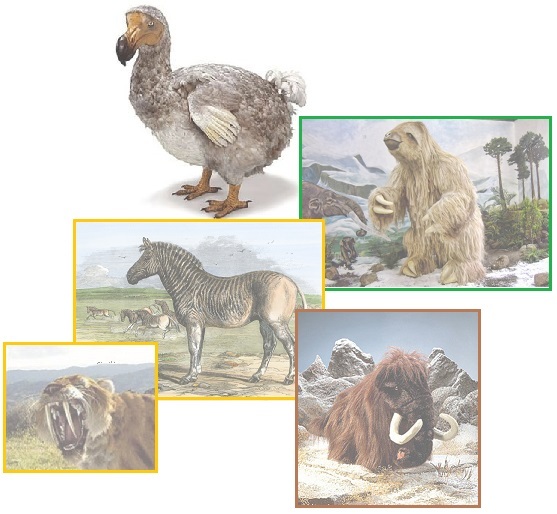 The last two ideas have subsequently been ruled out as inconsistent with the paleontological record. 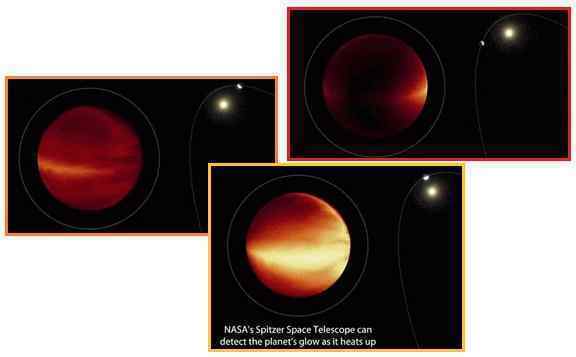 Only Planet X remained as a viable theory, and it is now gaining renewed attention. In 1985, a look at the paleontological record supported the idea of regular comet showers dating back 250 million years. Newer research shows evidence of such events dating as far back as 500 million years. As astronomers track down more clues as to the existence of a large world orbiting the sun in the outer fringes of the solar system, a classic planetary purveyor of doom has been resurrected as a possible trigger behind mass extinctions on Earth. Profiteers and fame-hunting soothsayers concocted all kinds of doomsday scenarios that would happen on that day. One of them being the nonsensical notion that Planet X (or the even more farcical "Niburu") was rampaging through the solar system to, you guessed it, wipe out all life on Earth — either through a cometary barrage or solar firestorm. Search for Alien Life Expands to 20,000 Star Systems: Planets Orbiting Red Dwarfs may be more Habitable than thought, says Seti. Exoplanet data have suggested that somewhere between one sixth and one half of red dwarf stars have planets in their habitable zones, a percentage comparable to, and possibly greater than, for Sun-like star. ZetaTalk Insight 4/9/2016: What is notable in this series of articles, posted between March 28 and April 2 on various news outlets, is not the content but the rush to print. The subjects – periodic catastrophes on Earth, periodic extinctions on Earth, the old theory of a Planet X out there tugging at the Earth, planets orbiting red dwarf suns, traveling exoplanets, eccentric orbits, and life bearing planets – all relate to Nibiru and its periodic passages or to the existence of the Sun’s dark binary 18.74 Sun-Pluto distances away from the Sun. The media suddenly supporting this rush to print includes scientific as well as popular media outlets such as the Daily Mail and RT. In that we have recently called the media attention to the discovery of what is being called Planet 9 a “prong” in a gradual announcement process, might this rush to print be called another prong? Certainly some news is about to break, and thus the public is being rapidly educated. Since the ZetaTalk saga began 20 years ago, the cover-up over the existence of Nibiru, a habitable traveling planet with an odd orbit, has moved from a denial that planets can roam far from their suns, a denial that a planet such as the mythical Nibiru exists, a claim that other life bearing planets have not yet been discovered, and a denial that intelligent life from elsewhere is visiting the Earth. This gradually moved to admitting the existence of exoplanets seemingly wandering around space unattached to their suns, increasing amateur video on the Internet showing evidence of objects seen near the Sun, the term Nibiru used extensively on the Internet, repeated announcements by NASA et al that evidence of life bearing planets continues to be discovered, and evidence of mass extinctions in the near and far past documented for public consumption. This has been a slow process, deliberately so. But now the knowledge gap is being closed with great haste. Clearly media editors were asked to cooperate in this regard, and clearly another prong is just ahead! Nibiru’s impact on the Earth’s magnetosphere became apparent years ago, after Nibiru, aka Planet X, entered the inner solar system. The approach of Planet X has increasingly shown up on simulations of the Earth’s magnetosphere. From the unexplained hole in the bowshock facing Planet X first reported in 2008 to the twisted wings of the magnetosphere that began in 2009, the contortions have been unexplained by solar activity. 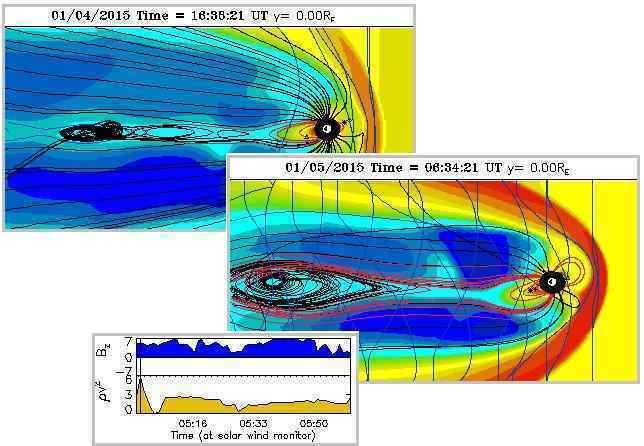 Magnetosphere eddy flows began to show up in 2010. Now they are back with a vengeance. Howard, of the Pole Shift ning points out that magnetosphere eddy flows were continuous for days as these BATRUS charts show. Yet just a year ago, when this issue of the eddy flows was covered in Issue 439 of this newsletter on March 1, 2015, the blasts would only last for a day. The blasts have moved from being intermittent to being what could be called continuous. The Zetas predicted this increase. ZetaTalk Prediction 1/10/2015: What does this eddy flow of magnetons showing up in the Earth’s magnetic models mean for the near future of planet Earth? We have consistently warned that electro-magnetic pulse, the arcing from the electronic screech in compressed rock to the charged tail of Planet X, will be on the increase. This brings down the grid, as surge and brownout destroy electronic infrastructure and electronic grids are designed to protect themselves thus. Blackouts, electronically damaged airplanes such as AF447 and MH370 and now AA8501, and interference with mankind’s satellites will be on the increase. Today, as in the past, these blasts showing up on the BATRUS charts would occur during periods of minimal solar activity. But NASA et al, frantic to deny the presence of Nibiru in the inner solar system, would muster forth excuses to blame the Sun somehow. Coronal holes have been used in this regard. 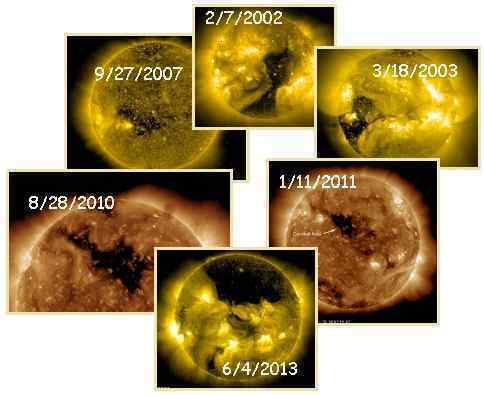 Despite the fact that huge coronal holes have been present in the past, in 2002 and 2003, with no effect on the Earth, the attempt to blame magnetosphere blasts on a coronal hole was tried in 2013. ZetaTalk Statement 8/3/2013: The large coronal hole observed in 2013 is equivalent in size, when total area is computed, to others during this past solar cycle such as the 2002 coronal hole. Given the continuous magnetosphere blast noted by Howard, what is NASA to do? Invent a coronal hole! Articles hit the news saying that birds were confused and GPS out of order, all because of a coronal hole that was nowhere evident on the day the articles hit the press! Three coronal holes spread across the sun are pointing at the Earth. As a result, a minor geomagnetic storm alert has been issued for Saturday by the U.S. Space Weather Prediction Center in Boulder, Colorado, and the Space Weather Operations Centre of the U.K. Met Office in Exeter. Space Weather Forecast Headline: Geomagnetic Storms likely later 1st April or during 2nd April. Solar activity been very low through the past 24 hours with no flares of any significance. There is one sunspot region on the visible disc, named 2526, classified as the most simple and stable type. Although a couple of filament eruptions were observed yesterday, no significant Earth-directed coronal mass ejections have been observed or are expected. Solar radiation is expected to remain at low background levels. There are currently no active notifications. 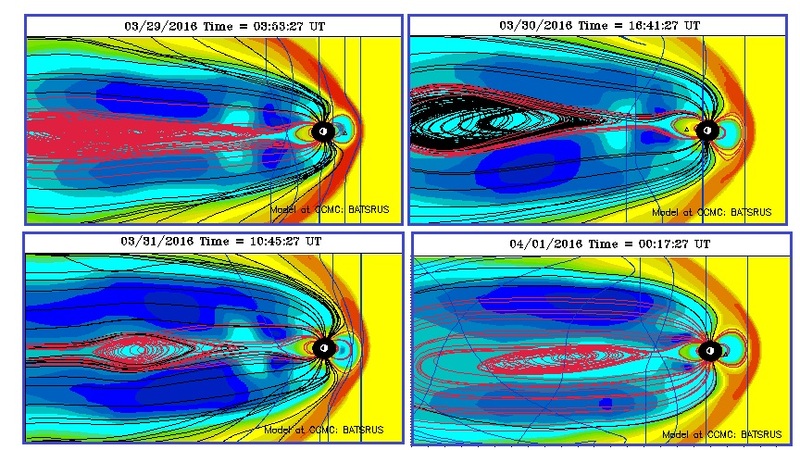 Another clue that the magnetosphere blasts are picking up the pace are the dramatic spirals being caught on camera, as documented on the Pole Shift ning blog dedicated to spirals. 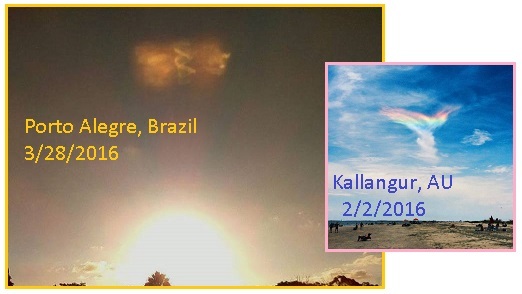 On February 20 a rainbow spiral was captured on film in Kallangur, Australia and on March 28 dramatic corkscrew spirals above the Sun were captured in Porto Alegre, Brazil. Why did the Russian Orthodox Patriarch Kirill visit Antarctica when he was in the Americas early last February to meet with Pope Francis in Cuba? There he is, strolling about and chatting with the penguins. Then the news broke that China has a secret observatory in Patagonia, in place for the past four years. Then Obama felt the need to bop down to Argentina for a tango. Per the Zetas, this visit and other trips by officialdom in February and March show that Antarctica is the focus. 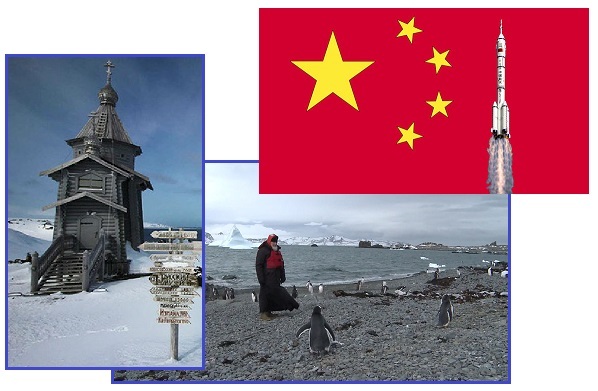 Russian Orthodox Patriarch Kirill has come to the Antarctic to visit the only permanent church in the South Pole, to talk with scientists at a Russian polar station, and of course to congregate with penguins. The wooden Holy Trinity church was built in the early 2000s and is the only permanent place of worship in the Antarctic. The visit comes as part of Kirill's Latin America trip, which saw an unprecedented historic meeting with Pope Francis in Havana on February 12. The station will be located in the Patagonia region of Argentina, which provides flat expanses that are suitable for space exploration work. The location also provides China the ability to conduct research from the Southern Hemisphere. Through the use of large antennae, researchers will be able use the space and its facilities to monitor the moon and other celestial bodies. US president Barack Obama attempted to show off his Latin dance moves on 23 March when he took to the dance floor to tango during his state visit to Argentina. Video of the moment shows Obama perform the sultry traditional Argentine dance with celebrated female Argentine tango dancer Mora Godoy at an official state dinner hosted by President Mauricio Macri in Buenos Aires. ZetaTalk Comment 4/2/2016: Is there a nexus between the US National Intelligence Program director Clapper’s secretive visit to Australia and New Zealand in early March, the press revelation in March of a secretive China space observatory having been established in Patagonia, Obama’s pressing need to visit Argentina in March, and the Russian Orthodox Patriarch Kirill visiting Antarctica in late February? There is indeed, and the fact that all of these countries surround the continent of Antarctica is no accident. Antarctica will be newly habitable land in the Aftertime, as will the new land due to rise between the tip of S America and S Africa, and the rush to make claims there no secret. It is no secret that the dominance of the dollar as the world’s currency has been challenged, the World Bank and IMF losing ground to the BRICS consortium and the China yuan. Brazil is part of the BRICS consortium, as are China and S Africa. Obama is embarrassed by the silent coup displacing him, and encouraged by political allies in the US, sought to counter the impact of the news that China had established a foothold, an observatory, in Patagonia. Thus, the tango in Argentina. The US has clearly lost the battle for allies on many fronts surrounding Antarctica, with Russia on the ascendant. Why is Antarctica so important? The Zetas have predicted that the new geography after the Pole Shift will put the new Equator running through Antarctica. Then there is the new land that is predicted to rise between the tip of S America and S Africa. Where it will take awhile for all the ice covering Antarctica to melt, this is solid ground, and a fresh water lake lies below the ice. The new land to rise above the waves, on the side of the Antarctic Plate that will be pushed up when the Pacific Plates compress, will of course be mushy ocean bottom for awhile, but certainly rich in nutrients for the new equatorial vegetation that will follow. So why was the NSA’s intelligence chief Clapper visiting New Zealand and Australia during this key time period, in March? 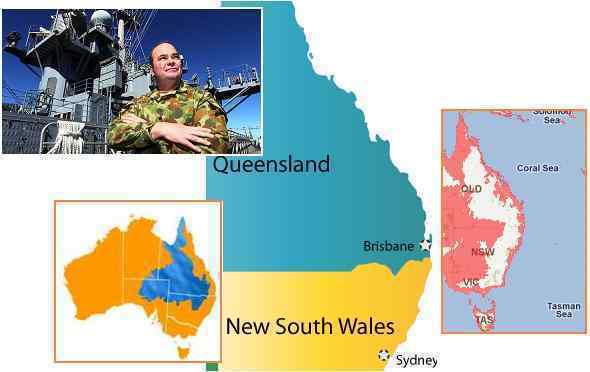 In 2011, during an exercise off the Queensland coast, Vice Admiral Van Buskirk inferred that talks were in process for a permanent US base in eastern Australia. Per the Zetas, the retiring Clapper was to explain that the deal is now off. General Dunford will not have the US forces deployed around the globe to protect the elite. The Queen, and the wealthy of Dubai, will have to look elsewhere for that. Mr Clapper is the chief intelligence adviser to Mr Obama and oversees the 16 agencies within the US intelligence community including the CIA and National Security Agency. Mr Key said Mr Clapper, has been America's intelligence chief since 2010. He is retiring before President Obama effectively steps down in 2017. America's top spy, the US Director of National Intelligence, is on a secret visit to Australia, the ABC has learnt. James Robert Clapper Jr directs the US National Intelligence Program and reports directly to President Barack Obama. Before flying to Australia Mr Clapper stopped over in New Zealand where he met with Prime Minister John Key. Last week the Australian Federal Police hosted the Director of the Federal Bureau of Investigation James B Comey on a two-day visit to Australia. ZetaTalk Comment 4/2/2016: As we confirmed recently, Chief of Staff Dunford is now in charge of the US government, having affected a silent coup in late September, 2015. Where not announced or admitted in the press, US allies around the world needed to be informed. Lest there be any confusion, there is a new Sheriff in town, nor will that arrangement change as a result of the 2016 elections. Former alliances and agreements with the US elite will no longer be honored by Dunford, and this hard message is being personally delivered by the outgoing Clapper.